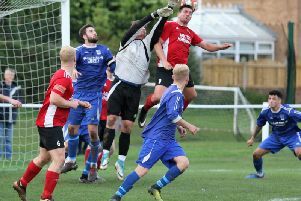 Knaresborough Town saw two points evaporate as Worksop Town netted a last-gasp equaliser in Saturday's NCEL Premier Division clash at Manse Lane. Paul Stansfield's team had snatched a late victory over Thackley in midweek, but it was they who were to concede at the death on this occasion, just failing to hold on for a 3-2 success. Boro began the day top of the table and made a fine start to what turned out to be a thrilling encounter. Ben Cohen found space on the right before crossing low for Nick Black to slide home the opening goal after just 90 seconds. Matthew Sykes then shot narrowly wide for Worksop before Cohen had a shot saved at the other end following Rob Youhill’s pass. 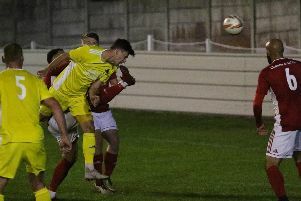 Boro's Sam Cook nodded over when well-placed after Will Lenehan headed on a Dan Thirkell free-kick, but when Worksop countered, Laurie Wilson fired against the outside of the upright. The visitors then levelled with 28 minutes on the clock as the hosts surrendered possession in midfield and Kyle Jordan squeezed a low shot inside the far post. Cohen saw an overhead-kick go wide, but the winger put his side back into the lead when Youhill once again got the better of Sykes and crossed low across goal. Thirkell then left the field with an ankle injury and Knaresborough had to re-shuffle their defence before Youhill had a shot saved by visiting custodian David Reay. The score was however levelled once again in the 40th minute, Sykes curling a strike past Liam Corbett, a late replacement in the home goal after Jack Rushworth was injured in the warm-up. Sykes and Jordan both fired wide for the visitors after the break, but Knaresborough went 3-2 up in the 63rd minute following a great move down the left that saw Black feed in Brad Walker to finish. Cohen then shot over before Corbett tipped a Steve Woolley free-kick around his post. A header from Matthew Reay flew over following a corner and, as time ticked on, Worksop began to look increasingly dangerous as Boro struggled to hold the ball for long periods. Jordan was wide and Corbett saved from Charlie Taylor before a late throw-in was not fully cleared and Sykes hit home a low shot to earn the away team a share of the spoils. A win would have kept Stansfield's team top of the pile, but the draw sees them drop down to fourth place.